As Security Council renews UNIFIL's mandate, Israeli Ambassador calls to expel Hezbollah from the area. The UN Security Council on Tuesday renewed the mandate of the UN’s Interim Force in Lebanon (UNIFIL), which will continue to operate with 11,000 peacekeepers and observers, with a total annual budget of $100 million U.S. According to the renewed mandate, the force will continue to operate in southern Lebanon to implement Security Council Resolution 1701, which ended the Second Lebanon War in 2006. According to the resolution, Hezbollah must not be allowed operate in southern Lebanon and the entire area of southern Lebanon must be free of any armed personnel and weapons other than those of the Government of Lebanon. “A decade after the Second Lebanon War, it’s time to expel Hezbollah forces out of southern Lebanon, and implement resolution 1701 to its full extent,” he continued. Hezbollah leader Hassan Nasrallah has several times in recent weeks made public appearances, boasting of his group's “victory” in the 2006 war and claiming that Israel is deterred by Lebanon. In a previous interview several months ago, Nasrallah threatened to target civilian sites across Israel and to invade the northern Galilee region. He previously suggested that the organization would strike Israel’s chemical plants in Haifa, referring to the ammonia storage tanks there as “Hezbollah’s nuclear bomb”. 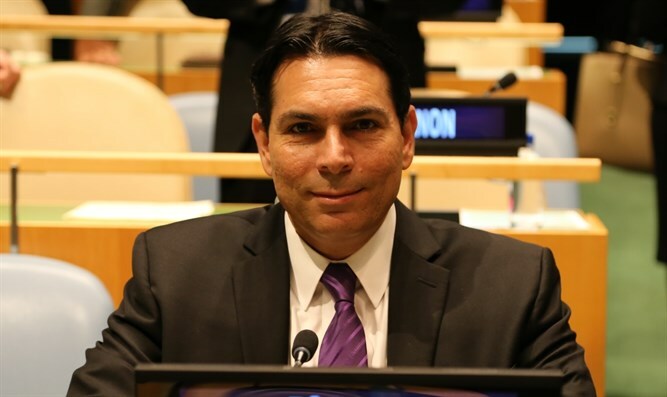 Last July, Ambassador Danon revealed new intel at the Security Council that provided further proof that Hezbollah has been hijacking civilian villages and turning them into terror outposts. This information included recent aerial photos and a detailed intelligence analysis which exposed Hezbollah’s terror outposts.